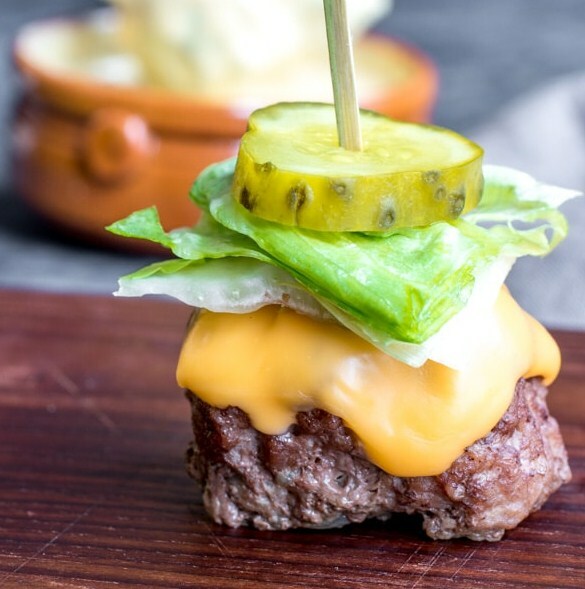 These Low Carb Big Mac Bites are a keto recipe for mini bunless burgers that make a great low carb appetizer or game day food that everyone will love! In a large bowl combine ground beef, onions, and salt. Mix until thoroughly combined. Roll the beef into 1.5 ounce balls. Press each one down slightly to flatten it to make a mini burger patty and place it on a lined baking sheet. Bake at 400 degrees F for 15 minutes or until cooked through. While burgers cook add all of the secrete sauce ingredients to a bowl and stir to combine. When the burgers are done baking turn off the oven and remove them. Pat any excess grease off. Cut each cheese slice into four squares and place a square on each mini patty. Place back in the cooling oven and let the cheese melt. Place a few squares of lettuce and a pickle slice on top of each meatball and run a skewer through it. Serve with the secret sauce and enjoy!